Limb Girdle Muscular Dystrophy (LGMD)is a term for a group of diseases that cause weakness and wasting of the muscles in the arms and legs. The shoulder ‘girdle’ is the bony structure that surrounds the shoulder area, and the pelvic ‘girdle’ is the bony structure surrounding the hips. Collectively, these are called the “limb girdles”, and it is the muscles connected to the “limb girdles” that are the most affected in LGMD. There are more than 30 known sub-types (forms) of Limb Girdle Muscular Dystrophy (LGMD)…with more being discovered each year. Because the different forms of Limb Girdle Muscular Dystrophy (LGMD) look very similar in clinical tests, genetic testing is required to confirm a diagnosis. Limb Girdle Muscular Dystrophy (LGMD) is progressive –meaning that the muscle weakness continually worsens. It’s not yet possible to predict the course of LGMD in an individual. The rate of progression can vary from person to person even within the same LGMD sub-type. Some forms of the disorder progress to loss of walking ability within a few years and cause serious disability, while others progress very slowly over many years and cause minimal disability. At this time, progression in each type of LGMD can’t be predicted with certainty, although knowing the genetic mutation underlying your disease can be helpful. Limb Girdle Muscular Dystrophy (LGMD) are neuromuscular disorders which are inherited. People are born with LGMD which is caused by specific gene mutations. LGMD is not contagious or caused by an injury or any specific activity. All sub-types or forms of Limb Girdle Muscular Dystrophy (LGMD) are classified as rare diseases. A disease or disorder is defined as rare in Europe when it affects less than 1 in 2000. In the USA a disease or disorder is defined as rare when it affects fewer than 200,000 Americans at any given time. The muscles most commonly affected by LGMD are those closest to the body (proximal muscles)…shoulders, upper arms, thighs, and pelvic area. Whereas distal muscles, those further away from the body (such as hands and feet) may become affected in late stages of LGMD, if at all. Over time, the individual with LGMD loses muscle bulk and strength. Currently, there are no cures or treatment for Limb Girdle Muscular Dystrophy (LGMD). Limb Girdle Muscular Dystrophy (LGMD) can affect the heart and muscles necessary for breathing. The heart can be affected in some forms or sub-types of LGMD, but this doesn’t occur as often as it does in some other forms of muscular dystrophy. Heart problems can take two forms — weakness of the heart muscle (cardiomyopathy) and abnormal transmission of signals that regulate the heartbeat (conduction abnormalities or arrhythmias). The heart should be monitored for these complications. When necessary, medications or devices (such as pacemakers) can be used to treat them. Heart abnormalities are not associated with all LGMD sub-types. The muscles of the respiratory system may also become involved in some forms or sub-types of LGMD resulting in difficulty swallowing (dysphagia), slurred speech (dysarthria), and/or breathing difficulties. Breathing difficulties may become progressively worse as the disease progresses. Limb Girdle Muscular Dystrophy (LGMD) is inherited… it is not contagious or caused by an injury or any specific activity. LGMD Sub-types with a “1” in the nomenclature (such as LGMD1A, LGMD1B, LGMD1C) have an autosomal dominant inheritance pattern. In autosomal dominant inheritance, only one parent needs to transmit the mutated gene for the disorder to be inherited. Even though the matching gene from the other parent is unaffected, the faulty gene dominates. Autosomal dominant disorders typically appear in every generation without skips. LGMD Sub-types with a “2” in the nomenclature (such as LGMD2A, LGMD2B, LGMD2C) have an autosomal recessive inheritance pattern. In autosomal recessive inheritance, both parents must be carriers of the faulty gene for their child to inherit the disease. Most forms of LGMD are inherited in a recessive (type 2) pattern. Males and females can inherit Limb Girdle Muscular Dystrophy (LGMD). 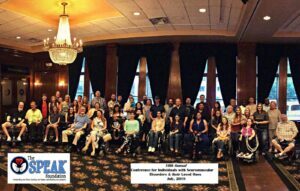 Limb Girdle Muscular Dystrophy does not discriminate! Females and males can inherit this progressive neuro-muscular disease. Limb Girdle Muscular Dystrophy (LGMD) symptoms can first appear at any age…childhood, teens, adulthood or even later in life. Typically, the earlier the onset of the disease, the more severe the symptoms over time. The speed of progression varies between people and is often not linear. Limb Girdle Muscular Dystrophy (LGMD) occurs in all parts of the world. LGMD is also known to occur among all ethnic groups. Limb Girdle Muscular Dystrophy (LGMD) is known to occur among all ethnic groups. LGMD occurs in all parts of the world and can be diagnosed in women and men. Symptoms can first appear at any age – childhood, teens, adulthood. Limb Girdle Muscular Dystrophy (LGMD) are genetic diseases, which means that people are born with them. LGMD which is caused by specific gene mutations that people inherit. LGMD is not contagious or caused by an injury or any specific activity. There are over 30 different types of Limb Girdle Muscular Dystrophy (LGMD), each caused by mutations in a different gene. Genetic testing using a saliva or blood sample is utilized to confirm a diagnosis of LGMD based on the known gene mutation. Some people with Limb Girdle Muscular Dystrophy (LGMD) may appear stronger than their peers when they are young. LGMD symptoms can first appear at any age…childhood, teens, adulthood or even later in life. Many people with Limb Girdle Muscular Dystrophy (LGMD) eventually lose the ability to walk and become completely reliant on wheelchairs. 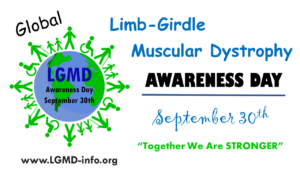 Our intention is that the Limb Girdle Muscular Dystrophy Awareness Day will be celebrated and acknowledged globally. There won’t be a single event, but instead, we are encouraging people in many parts of the world to set up activities to commemorate the day, according to their customs and practices. Limb Girdle Muscular Dystrophy (LGMD) refers to a group of rare muscle-wasting diseases. The muscles most commonly affected by LGMD are those closest to the body (proximal muscles)…shoulders, upper arms, thighs, and pelvic area. Whereas distal muscles, those further away from the body (such as hands and feet) may become affected in late stages of LGMD, if at all. Over time, the individual with LGMD loses muscle bulk and strength. Limb Girdle Muscular Dystrophy (LGMD) sub-types with an autosomal dominant inheritance pattern are categorized as LGMD type 1 (LGMD1). LGMD sub-types with a “1” in the nomenclature (such as LGMD1A, LGMD1B) have an autosomal dominant inheritance pattern. In autosomal dominant inheritance, only one parent needs to transmit the mutated gene for the disorder to be inherited. Even though the matching gene from the other parent is unaffected, the faulty gene dominates. Autosomal dominant disorders typically appear in every generation without skips. If a person affected with an autosomal dominant disorder decides to have children, each offspring has a 50% chance of inheriting the faulty gene and developing the disorder. Children who do not inherit the affected gene will not develop or pass the disorder to their offspring. Those individuals with an autosomal dominant pattern of LGMD are classified as “type 1.” When the specific mutated gene is identified, a letter is then assigned to designate the specific LGMD sub-type. For example, an individual who has inherited a mutation in the CAV3 gene in a dominant pattern is identified as having LGMD Type 1C or LGMD1C. Limb Girdle Muscular Dystrophy (LGMD) sub-types with an autosomal recessive inheritance pattern are categorized as LGMD type 2 (LGMD2). LGMD sub-types with a “2” in the nomenclature (such as LGMD2A, LGMD2B) have an autosomal recessive inheritance pattern. In autosomal recessive inheritance, both parents must be carriers of the faulty gene for their child to inherit the disease. A carrier harbors the faulty gene but usually shows no symptoms. When a mutation is recessive, it can exist in a person without showing any symptoms so long as their other copy of the same gene is healthy. The unaffected gene masks the mutation. However, if a child inherits two copies of the mutated gene, there is no healthy alternative to block the faulty gene out, and so the symptoms manifest themselves. Those individuals with an autosomal recessive pattern of LGMD are classified as “type 2”. When the specific genes are identified a letter is then assigned to designate the specific sub-type. For example, an individual who has inherited a mutation in the CAP3 gene in a recessive pattern would be identified as having LGMD Type 2A or LGMD2A. Most forms of LGMD are inherited in a recessive (type 2) pattern. 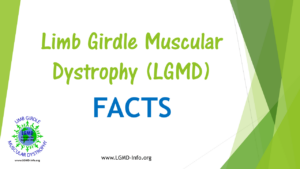 The severity, age of onset, and symptoms of Limb Girdle Muscle Dystrophy (LGMD) vary among the many subtypes or forms of this condition. It’s not yet possible to predict the course of LGMD in an individual. The age of onset and rate of progression can vary from person to person even within the same LGMD sub-type. Although the progression in each type of LGMD can’t be predicted with certainty, knowing the genetic mutation underlying your disease can be helpful for medical management. For resources to obtain genetic testing for LGMD, please visit the LGMD Resource page on our website. It is very important for you to get a genetically confirmed LGMD diagnosis. If your doctor tells you that you have an LGMD but doesn’t genetically confirm it, your diagnosis is incomplete. Types of Limb Girdle Muscular Dystrophy with a dominant inheritance pattern can run in families as parents with the mutation have a 50% chance of passing it on to their children. Early symptoms of Limb Girdle Muscular Dystrophy may include difficulty climbing stairs, frequent falls, difficulty rising from a seated position or even the inability to stand on their toes. In late stages of Limb Girdle Muscular Dystrophy, people may experience: difficulty rolling over in bed, getting dressed independently or raising a glass to take a sip of a beverage. Limb Girdle Muscular Dystrophy (LGMD) is classified as an orphaned disease, therefore, lacks funding for research. An orphan disease is defined as a condition that affects fewer than 200,000 people nationwide. Limb Girdle Muscular Dystrophy (LGMD) primarily affects voluntary muscles. Voluntary muscles, also known as striated, skeletal or striped muscles, refer to muscles that are within a person’s control and are generally attached to the skeleton. The voluntary muscles most commonly affected by LGMD are those closest to the body (proximal muscles)…shoulders, upper arms, thighs, and pelvic area. Involuntary muscles, except for the heart (which is a special type of involuntary muscle), are not generally affected by Limb Girdle Muscular Dystrophy (LGMD). Involuntary muscles are muscles which contract without conscious control and are found in walls of internal organs such as stomach, intestine, bladder, and blood vessels (excluding the heart). Most forms of Limb Girdle Muscular Dystrophy (LGMD) do not affect the brain, intellect or the senses. People with LGMD can think, see, hear and feel sensations as well as those without muscular dystrophy. Pompe Disease mentioned is a recent presidential speech is a form of LGMD. On Feb. 28, 2017, President Trump gave a speech to the U.S. Congress during which he mentioned Rare Disease Day and a patient with Pompe Disease who has been treated successfully with a newly-developed drug. -Pompe Disease is considered a form of Limb Girdle Muscular Dystrophy (LGMD2V). -Pompe Disease is caused by a deficiency in an enzyme called GAA, which is required for muscles to properly store and use energy from food. -Depending on the degree of deficiency in the enzyme, the symptoms of Pompe Disease can begin in infancy, or later in a person’s life. -Patients with later-onset Pompe Disease are often diagnosed as having an unspecified type of LGMD. -Genetic testing is required to determine if a person has Pompe Disease or a different form of LGMD. -Genetic testing of undiagnosed LGMD patients can identify people who can benefit from the Pompe treatment. 26 Different genetic forms of recessive LGMD have been found: LGMD2A – 2Z. The naming system for LGMDs (types with dominant inheritance are 1A, 1B, etc., types with recessive inheritance are 2A, 2B, …) was created in 1995 when only a few genes responsible for LGMD were identified. Now, so many genetic forms of LGMD have been found that for the recessive types of LGMD, the alphabet has been exhausted: 2A through 2Z have all been assigned to different genes. This led to an international meeting of LGMD experts which took place in the Netherlands in March 2017 to come up with a new naming system as more genetic types are discovered. Distal muscles (those further away from the center – such as in the hands and feet) are affected in late stages of Limb Girdle Muscular Dystrophy (LGMD), if at all. The muscles most commonly affected by LGMD are generally those closest to the body (proximal muscles)…shoulders, upper arms, thighs, and pelvic area. Over time, the individual with LGMD loses muscle bulk and strength. Individuals with Limb Girdle Muscular Dystrophy (LGMD) may be sensitive to temperature changes and may frequently struggle with being cold. Keeping warm can be a challenge regardless of the weather or season. Being cold is in part often related to decreased mobility and the fact that the muscles are not contracting as much therefore resulting is deduced circulation of blood. It is not uncommon for individuals to rely on a variety of products to help warm them up such as electric blankets, heated clothing, hand/toe warmers, heat packs, etc. Symptoms and progression of Limb Girdle Muscular Dystrophy (LGMD) disorders vary among patients of the same subtype, or even within the same family. 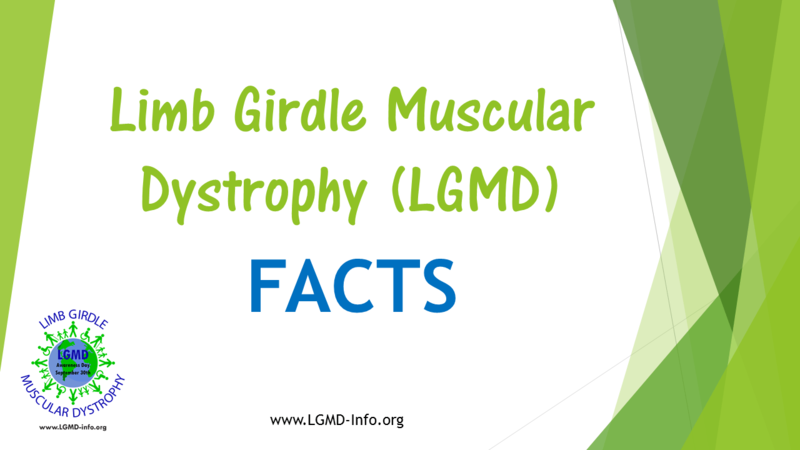 LGMD stands for “Limb Girdle Muscular Dystrophy”… a group of rare neuromuscular diseases. Individuals with LGMD may develop an abnormal curvature of their spine. As muscle weakness progresses, an individual with LGMD may experience a change in their posture. Scoliosis refers to an abnormal side-to-side curvature of the spine. And, an abnormal front-to-back curvature of the lower spine is known as lordosis. Elevated CK (creatine kinase) levels can be one of the first signs of LGMD. Early in the diagnostic process, doctors often order a special blood test called a CK level. CK stands for creatine kinase, an enzyme that leaks out of damaged muscle. When elevated CK levels are found in a blood sample, it usually means muscle is being destroyed by some abnormal process, such as a muscular dystrophy or inflammation. Therefore, a high CK level suggests that the muscles themselves are the likely cause of the weakness, but it doesn’t tell exactly what the muscle disorder might be. CK levels are often raised in some LGMD sub-types but can be normal in other forms of LGMD. During the diagnostic process, the CK level is one clue that can help a physician distinguish between different LGMD sub-types and other muscle diseases. A diagnosis usually involves combining information from the patient’s symptoms and various tests including serum creatine kinase (CK), muscle biopsy, electromyogram (EMG) testing and genetic testing. Many individuals with LGMD can maintain an active lifestyle – including participation in sports activities. For individuals with a physical disability such as the muscle weakness caused by LGMD, there are still many adaptive sports and recreation programs that can be enjoyed for health, wellness, leisure, social, and competition benefits. Some of the adaptive sports for individuals with disabilities include horseback riding, golf, water skiing, parachuting, paddling, sailing, tennis, basketball, hockey, target shooting, archery, pool, fishing, hunting, table tennis, snorkeling, bowling, scuba, snow skiing, and many more. Before participating in recreational activities or sports, check with your physical therapist or physician to be sure that you are healthy enough for exercise, and what amounts of physical activity are safe for you. A physical therapist can help you determine possible modifications to equipment, and advise which activities might be best for you. Several organizations are devoted to providing people with disabilities the opportunity to enjoy sports and recreation of all types. You may want to check with your local rehab facility or contact a sports club or association to see if an adaptive program is available in your area. Skeletal and cardiac muscles are thought to be the only muscles affected by genetic mutations causing LGMD. Skeletal muscles are all the muscles that are bound to our bones. They are also called “voluntary” muscles, which means we can “control” their activity. Any tissue in our body would break if stretched and contracted like what happened to our muscles. Special structures were created (through evolution) to stabilize the membrane of our muscles and prevent breakage. In LGMD, some of these structures are not there or are not fully functional. Consequently, LGMD muscles break and degenerates. Individuals diagnosed with LGMD should have a Primary Care Physician in addition to their neurologist. 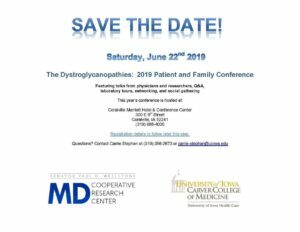 It is important that individuals with LGMD have a Primary Care Physician (such as a family practitioner, internist, pediatrician) in addition to their neurologist. The Primary Care Physician would be the doctor which would be seen for any routine medical care. Remember, having a diagnosis of LGMD is no protection against common illnesses — such as ear infections and chicken pox in children, or high blood pressure, diabetes, and cancer in adults — so you’ll want to have a primary care doctor! A Primary Care Physician can always make referrals to any specialty doctors and/or other health care professionals, as needed. Having dystrophic muscles does not mean that exercise is bad for you. Clinical studies in some LGMDs showed that moderate exercise, contrary to extreme exercise or no exercise, helps maintain muscle strength and therefore quality of life. This conclusion is in line with the feedback from people with LGMD. The challenge has been to define what represents moderate exercise for people with LGMD. The diaphragm is a skeletal muscle that is affected in some forms of Limb Girdle Muscular Dystrophy. The diaphragm is the muscle that pumps air in and out of the lungs. A weakened diaphragm only does that partially and does not properly flushed out the carbon dioxide out of the lungs during the night. This has several consequences like apnea or shallow breathing, both of which will lower the level of oxygen and increase the level of carbon dioxide in the blood. An elevated level of carbon dioxide in the blood is linked to headaches, confusion, and lethargy. An elevated level of carbon dioxide may also induce increased cardiac output, an elevation in arterial blood pressure. Thanks to advances in clinical care and research there are things that you can do to manage the respiratory effects of LGMD. There are preventative measures and interventions that can help you maintain your respiratory health and treat respiratory complications. Prevention and appropriate treatment of respiratory complications are critical in order to prevent long-term hospital admissions, loss of independence or life-threatening conditions. Know the signs of respiratory insufficiency: sleeping more often, constant fatigue, occasional confusion, difficulty concentrating, muscle twitching that did not previously exist, constant or periodic headaches, significant shortness of breath at rest, difficulty sleeping or lying down, unconsciousness or difficulty walking. For more information also visit us on Facebook.